Havasupai Falls on the Havasupai Indian Reservation is still one of my absolute favorite hiking trips of all time. It was around a 12 hour drive from Steamboat to get to the start of the hike (it is an 8 mile hike from the Hualapai Hilltop to Supai town and another 2 miles to the campground). The hike into the campground is generally all downhill and they recommend to take two days to cover the distance. We did it in one full day and arrived to the campsite around 5pm after leaving our car a little before 8am. There are also horses that I believe you can schedule to help carry your items to the town, however the town of Supai is really remote. No car traffic is able to get into or out of the town and the only accessibility is either by helicopter, horse, or hiking. It is also really important to remember that because of its remoteness, everything in the town is outrageously priced. I believe bottled water was 5 or 6 dollars! It's best to bring in all the food and necessities that you will need and I recommend planning to camp there for 4 or 5 days. We hiked there over Labor Day weekend and the weather was hot, but it still gets pretty cool at night once the sun leaves the canyon. We only stayed two nights, which was enough to see everything but I do wish we had at least another full day to spend there. Mooney Falls is the last Fall that you can easily get to and the hike to get down to the falls is pretty challenging. So challenging that I'm not sure if I would do it again. The ladders leading you down and up are almost completely perpendicular to the rocks and because they are close in proximity to the Falls, they are wet (makes it really slippery). We hiked down to the Falls twice (once to get to those falls) and once to go past Mooney Falls and hike the additional 2 miles to Beaver Falls. Havasu Falls was the most spectacular and I would recommend just planning to spend a full day there. There are great caverns to explore by the Falls and the atmosphere is really peaceful. Beaver Falls wasn't spectacular (although ANYTHING in this area is really amazing), but I absolutely LOVED the hike to get there. 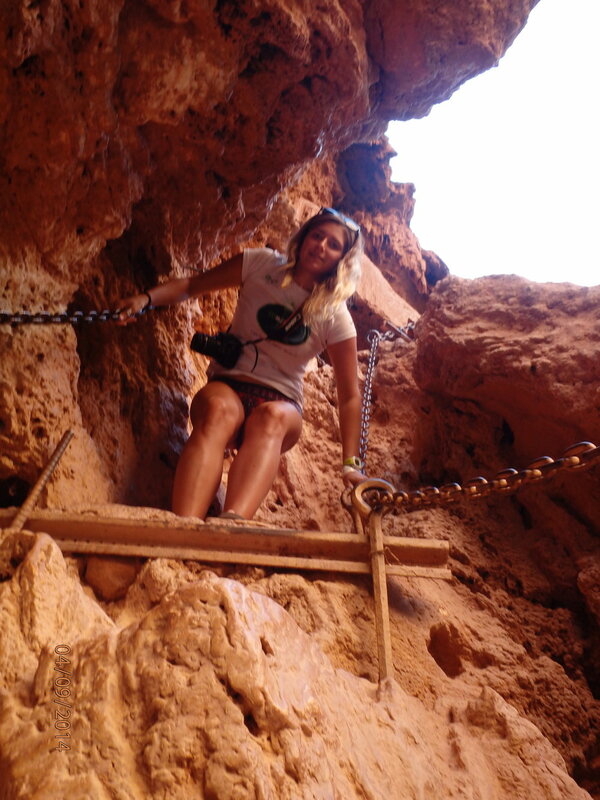 Although it really is challenging to get up and down the ladders at Mooney Falls- I wouldn't recommend it unless you are in fantastic shape, have great gripping waterproof shoes, and are not afraid of heights/ close areas. You have to maneuver through many small holes and traffic is coming in both directions. It's not for the faint of heart. You can still get really great photos from above the Falls (which I really recommend). waterproof, durable shoes (I love my Keens)- I wore them for almost the entire hike in and out, as well as around all the waterfalls. They are amazing! cash- It is expensive to travel to Supai and they didn't take credit cards when we were there in 2014. Entry fee is $50 and the campground was around $25 a night. a really good camera (or two). you'll want to remember these experiences!